If you’ve experienced common furnace problems, you might already know that there’s a lot of value in routine HVAC maintenance. DIY “pros” often know where to look for heater troubleshooting or central air conditioner maintenance, but for those of us who are less experienced, a few HVAC maintenance tips can go a long way. Let’s start with the basics: “HVAC” refers to the system in your home that regulates heating, ventilation and air conditioning. Usually that includes your furnace, central air conditioning unit and all of the ducts and parts that accompany them. While HVAC systems are designed to run on their own with little intervention from you, other than adjusting your thermostat, keeping your system regularly maintained can make a big difference with respect to its running properly. If you want DIY HVAC maintenance, we can guide you through where to begin. Use a high-efficiency furnace filter. Newer, pleated filters are more effective at grabbing tiny particles that carry bacteria. Check the filter monthly. If it looks dirty, replace it. Even if you don’t think you need to, replace it every 90 days. You might close your house’s air registers in order to direct the air where you need it most, but don’t close more than 20% of your registers because it will put extra strain on the HVAC equipment. Check out your outdoor units (air conditioners and heat pumps) and make sure that there are no leaves, pollen, branches, grass clippings or other items blocking the area. While you’re evaluating the outdoor units, also be sure that there is two feet of clearance on all sides and that they are level on the ground or platform. Periodically inspect insulation and refrigerant lines. If they are damaged or missing, replace them immediately. Turn off the furnace’s humidifier in the summer. When you turn it on in the fall, replace the humidifier wick filter and set the humidistat to the optimal setting (as recommended in the owner’s manual) before you turn on the water supply. It’s also advisable to have an annual professional inspection, even if you think you can do it yourself. HVAC equipment is expensive and complicated, and it’s a good idea to have it inspected annually. Sometimes, things go awry, even in well-maintained systems. Fortunately, there are tricks for heater troubleshooting and DIY AC repair that even a novice do-it-yourselfer can use to diagnose a problem. Thermostats: Sometimes, you just think you need a heater repair — do it yourself if it’s simpler than you thought. The first step should be to check the thermostat; the problem might be as simple as replacing the batteries. Or, if you use a programmable thermostat, it’s possible that a brief power outage or surge could have changed the programming. If anything looks to be unusual about your thermostat display, that device could be what’s affecting your heat or air conditioning problem. Power switches: What seems like the most obvious solution sometimes … isn’t. 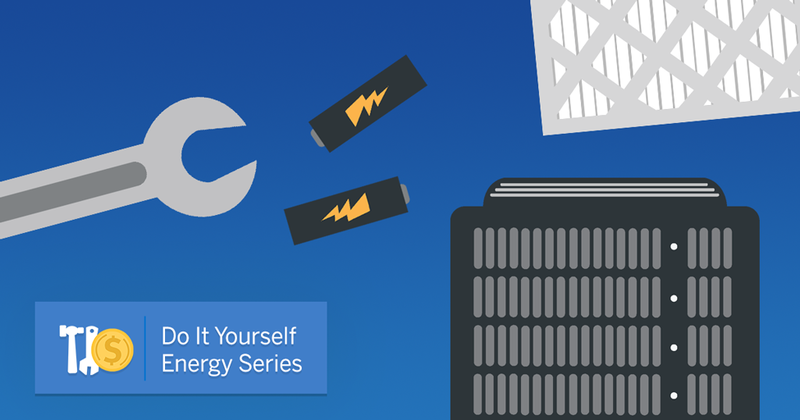 Often, the power switch to components of your HVAC system looks like a regular light switch. It’s usually located in your attic or basement, so if anyone in your house has been in those locations, it’s worth checking to see if any switches have been flipped if you’re having furnace trouble. Air filters: Common furnace problems can arise simply from forgetting to change the air filters. 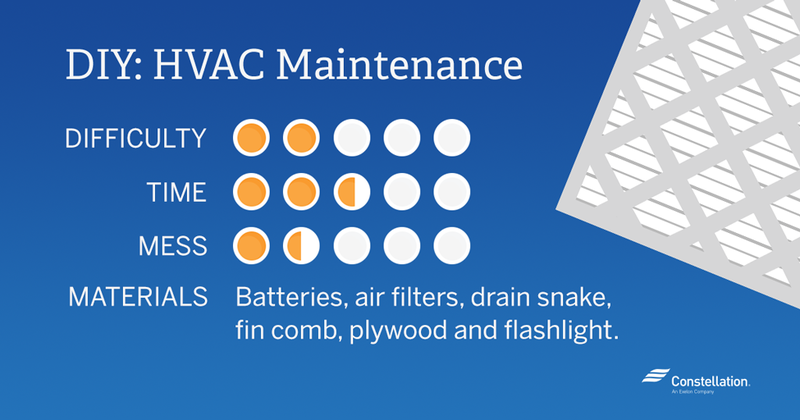 As you review the HVAC maintenance checklist, this is an important one. When the air filter is clogged, it means that the furnace has to work harder to pump the air through the house. When the furnace is working harder, it’s more likely to break down. Pro tip: Put a reminder in your smart phone or calendar for dates when you should replace your air filters. Or, you can sign up for a service that delivers air filters to your home. Also, know what model you have so that you can stock up when you see them in a store or online. Condenser unit: The condenser is the outdoor “box” that runs your central air conditioner; maintenance is important because it’s still part of your internal HVAC system. That means making sure that the airflow is free — check the unit periodically to see if there’s any debris or grass that is blocking air exits. If you’re having problems, this should be one of your first places to check. Circuit breakers: You’ve probably heard of brownouts (which is when the power company intentionally cuts some of the power, specifically in the summer, because the draw from the grid is too intense). Sometimes, if you have a brownout, or even if you don’t … an overheated air conditioning unit can overload your system and trip the breaker. If this happens, simply flip the breaker back to its normal position. But, if it happens often, you might want to contact a professional rather than DIY. HVAC repair can be complicated and this particular issue might mean it’s time to call in reinforcements. Central air conditioner maintenance doesn’t have to be a chore. These air conditioner maintenance tips can help make sure you keep your cool. Filters: Just like your furnace, and with all DIY HVAC maintenance — filters, filters, filters! Some filters can be cleaned and reused, and others need to be replaced regularly. Air conditioner coils: Evaporator and condenser coils collect dirt. While clean filters help, it’s still an important part of do-it-yourself HVAC maintenance to clean dirt and debris from the coils. Coil fins: You know those aluminum fins on your condenser? They don’t require much in the way of DIY HVAC repair, but they do need to be checked for bends and dents. You can purchase a “fin comb” that can straighten out bent fins. Drains: We’ve talked before about clogged drains in your sinks or showers, and the AC unit is no different. Part of your regular HVAC maintenance checklist should be occasionally snaking the drain channels for your condenser. Clogs can mean excess moisture, which could discolor your walls or carpet. Scheduled professional maintenance: Although you might want to do it yourself, HVAC systems usually require a once-per-year overhaul by a professional. The air conditioner should be included as part of that annual plan. Schedule an air conditioning tune-up with our sister company, Constellation Home. There are always two components to DIY HVAC maintenance: (1) routine maintenance to keep the system running smoothly, and (2) troubleshooting if something goes wrong. The HVAC maintenance tips above are a good start to keeping things going, but there are a few things that you can do specifically for your furnace. Check the circuit breaker. If you suddenly have a “dead” furnace or blank thermostat, the first thing to do is see if you’ve blown a fuse. Have your breaker box labeled at each switch so that you know immediately if the furnace switch is off. Check the furnace switch. The switch on the furnace should be set to “heat” (which might seem obvious, but if yours is a heater and AC unit, you have to make the switch every season). It’s a simple fix if you’re doing heater troubleshooting (and, by the way, check this even if you’re engaged in DIY AC repair — it could have the same issue on that end!). Check the pilot light. If your pilot light is located in a drafty area, it’s possible that it could have blown out. Close windows or doors, or block a draft, and then safely re-light it. If this does not work, it’s possible that you have a clogged pilot opening. Reset ignition control. If your furnace has an electric ignition, you can do a “reboot” by turning the thermostat all the way down or the power switch to “off.” Give it a few minutes and then turn everything on again to reset. One last thing … be aware of gas leaks! If you smell natural gas, or if your CO2 detector sounds, leave the house immediately, and leave windows and doors open for ventilation. A gas leak is an emergency situation, and you must call your gas utility or fire department as soon as you are outside the home and in a safe location. If you are able to do so safely, turn off the gas supply valve, which is usually near your gas meter on the inlet pipe. Rotate the valve one-quarter turn using a wrench. If you suspect a gas leak, do not light any matches or touch any switches until you have the all-clear from the utility or fire department. These solutions can help when it comes to HVAC maintenance DIY, but they definitely are not an exhaustive list of what could go wrong. When it comes to your heater and air conditioner, there are lots of moving parts (figuratively and literally), and sometimes you need to call a professional. However, no one likes it when you have to pay for a professional to walk through your door only to have him tell you that you only had to flip a switch or change your filter! So, by using these DIY HVAC maintenance tips, hopefully you can identify where to look and what to do before you make that call. In the case that your HVAC system is beyond repair and you’re thinking about a heating and air conditioning replacement, contact Constellation Home. If you have any good air conditioner maintenance tips, or other HVAC maintenance DIY pointers, we’d love to know — share in the comments below! Erik, thank you. We agree that HVAC maintenance is an important part of a home’s upkeep! Hi Lynne, that’s a good point. Balancing the cost of energy use vs cost of switching furnace filters is certainly a decision worth making. If you want to know more about furnaces (with filters) and how they compare to boilers (without filters), you can check out our post on Boiler vs. Furnace: Which Is More Energy Efficient?